Now happily settled in their home, Savannah Martin and Rafe Collier are looking forward to planning their wedding while they start decorating a nursery for the baby they are expecting. Savannah decided to sublet her apartment for a couple of months for extra cash until her lease runs out, and so far it has worked out well. Until she goes to the apartment to clean it before the next arrival, and finds a dead woman, who eerily looks a lot like her, in her bed. The investigation is being handled by their old friend, Detective Tamara Grimaldi, so Rafe won’t have to investigate this time. While he’s busy at the TBI, Savannah is cleaning out her office, having just been fired. Liz, the new hire (probably there to take Savannah’s place, she thinks), tells her that her sister came by on Saturday looking for her. But when she checks with her sister, Savannah finds out that her sister wasn’t in Nashville that day, but someone else she knows was…her ex-boyfriend, Todd Satterfield. And the “sister” that showed up at her office sent him a message using her computer, asking her to come to Savannah’s apartment. And they signed Savannah’s name to it. Grimaldi sends Rafe down to Sweetwater to talk to Todd, who lawyers up, and he drives to Dix’s office (Savannah’s brother). But he doesn’t give much information to Rafe, making himself look very guilty. When Todd’s connection to the dead woman is uncovered, Rafe is forced to go to Atlanta to find out what happened during the time that Todd lived there. So Savannah goes home to Sweetwater, where her mother is still holding out hope that she’ll dump Rafe and marry Todd. Between Rafe’s investigation in Atlanta, Grimaldi’s investigation in Nashville, and Savannah’s…non-investigation (after all, she promised Rafe she wouldn’t stick her nose in his investigation), the pieces slowly start to come together. Savannah heads home to Nashville, confident that, for once, she’s not the one in harm’s way. But when she gets home, she realizes that the danger is coming from someone they never suspected…and they are closer to Savannah than anyone realizes. I’ve been waiting very patiently (ok, maybe not THAT patiently) for the next installment in this wonderful series to come out, and I am happy to say that the wait was worth it. I think my favorite scenes (besides the descriptions of Rafe without various pieces of clothes on) were the ones between Savannah and her mother. It’s wonderful to see how much Savannah has grown and become more of her own person. The speeches she makes to Frances and her mother, and then later, the one at her mother’s house, were things I’ve been waiting for her to say for the last two or three books, and Jenna did not disappoint. She did a wonderful job writing these powerful, “I am me, I love this man, get over it” speeches for Savannah. I was laughing and cheering at the same time (my husband thought I had lost my mind) as I read them. As for whodunit, I figured out one part, but the rest of it had me guessing until the very end. Again, it was well worth the wait. A worthy addition to this delightful, awesome series. And now, I have to start patiently waiting for number ten…is it done yet? It’s Promote an Author Tuesday! Today I’m thrilled to be promoting the wonderful Jenna Bennett who I ADORE to death. If you haven’t read any of her books, then well, you better start now! With hotels in downtown filled to capacity months in advance, real estate agent Savannah Martin decides to pick up some extra money renting out her empty East Nashville apartment. She’s living with her boyfriend, and the place is just sitting there, begging to be put to use. 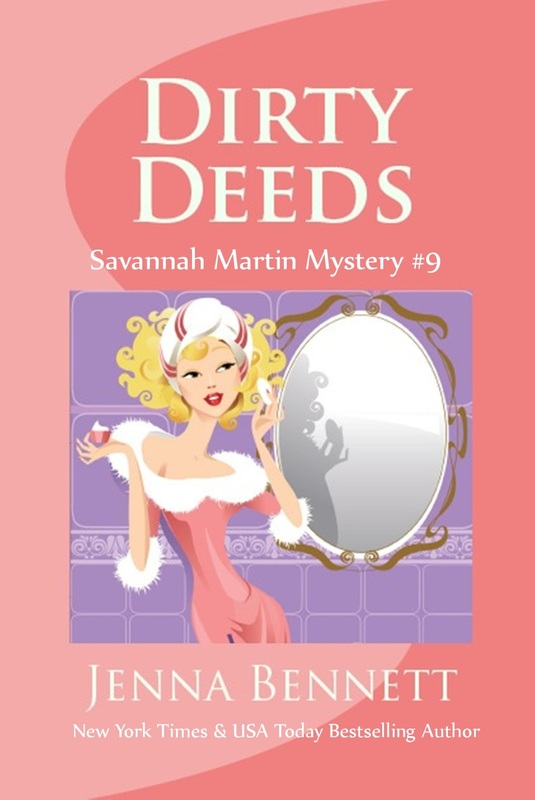 But when her latest tenant ends up dead—strangled in Savannah’s bed by what might have been a paying customer—the promise of easy money quickly turns sour. New York Times and USA Today bestselling author Jenna Bennett (Jennie Bentley) writes the Do It Yourself home renovation mysteries for Berkley Prime Crime and the Savannah Martin real estate mysteries for her own gratification. She also writes a variety of romance for a change of pace. Originally from Norway, she has spent more than twenty five years in the US, and still hasn’t been able to kick her native accent. There are a ton of books I wish I had written. To mention a few: Elizabeth Peters’s He Shall Thunder In The Sky, Lois McMaster Bujold’s Memory and A Civil Campaign, Jennifer Crusie’s Bet Me, and Terry Pratchett’s Night Watch. Not sure I have one. I didn’t have that exciting of a childhood. Didn’t try to jump off any buildings to see if I could fly, or get lost for a long time, or anything. My own memories are all about getting in trouble over one thing or another. Like staging a boycott of my French teacher’s class and talking all the other students into staying away, too. She walked into an empty room. I got in trouble, but it was fun while it lasted. She never forgave me, either. And I would totally do it again. Nasty woman. See the world. Or a lot more of it than I’ve seen so far. Where would Savannah and Rafe go on vacation? Tomatoes? Don’t know how I’d survive without tomatoes. I eat pounds and pounds of them every week. I’m pretty attached to my PC, too. And of course books. Don’t know what I’d do if there weren’t books to read. Happy Release Day Merry Farmer! Trail of Hope is Here! Trail of Hope (Hot on the Trail #2) by historical romance author Merry Farmer is here! Are you ready to ride the Oregon Trail? Available RIGHT NOW for only $3.99 on Amazon, iBooks, and Smashwords: 1-click your copy! Callie Lewis is alone on the Oregon Trail. After her brother’s death, she has been left to fend for herself on a journey she never wanted to take. Her only hope for safety and a life at the end of the road is to become a trail bride and wed grieving widower John Rye. But John is harboring secrets that could end their hasty marriage before it has a chance to begin. When a vicious tornado wakes John from the stupor the death of his wife left him in, he is ready to embrace Callie and the new life they could have together. But John is not the only one with designs on his new wife. Miles away from civilization, in a wagon train bristling with secrets and suspicion, John must catch a thief, fend off his rival, and reclaim his life to build the future Callie deserves. In their darkest moments will they bring each other hope? Trail of Hope is available RIGHT NOW on Amazon, iBooks, and Smashwords. Add it to your Goodreads want-to-read list right here. Sign up for Merry Farmer’s newsletter to get the scoop on future Hot on the Trail books and get superfan-only news, exclusives, and giveaways! 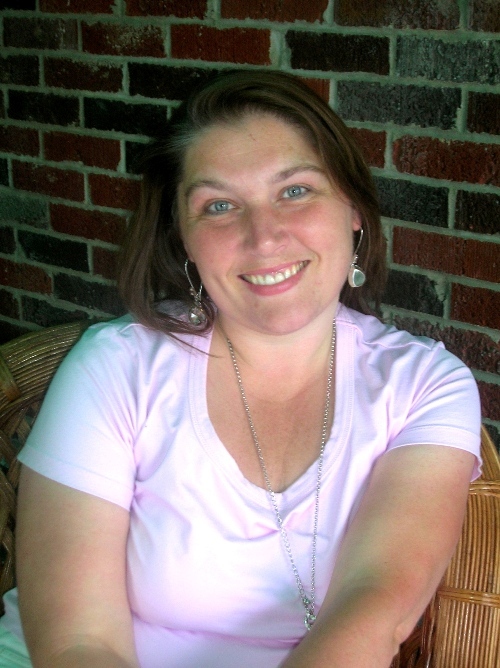 Merry Farmer is an award-winning author of historical romance. She lives in suburban Philadelphia with her two cats and enough story ideas to keep her writing until she’s 132. Her second novel, The Faithful Heart, was a 2102 RONE Award finalist and her unpublished futuristic novel A Man’s World won first place in the Novel: Character category at the 2013 Philadelphia Writer’s Conference. She is out to prove that you can make a living as a self-published author and to help others to do the same. Find Merry on her website, Facebook, Twitter, and Amazon Author Page. In their darkest moments will they bring each other hope or misery? Rory Anderson didn’t expect the furious barking coming from her backyard to turn her life upside down. But that’s exactly what happens when she goes outside and discovers a hand buried in her garden. That hand is attached to the body of Hester Bouquet, a local celebrity painter, and someone Rory had been avoiding. Did her suddenly missing gardener, Javier, bury Hester in Rory’s garden and leave town? It doesn’t help Rory’s plea of innocence when she intentionally leaves out a few things when she first meets Detective Green. They aren’t that important, are they? She notices him talking to her neighbors, who all start to look at her suspiciously. And the fact that Chief Marshall has a personal vendetta against her doesn’t help her case at all. With the help of her friend, Liz, Rory starts poking around in Hester’s life. The logical suspects appear to be the not-so-grieving widower, Julian, who seems to be a wee bit too close to another woman, Trudy, and their son, Kevin, who seems to resent his mother for some reason. Rory feels sorry for Julian’s assistant, Nora, who was very close to Hester and seemed to worship the very ground Hester walked on. A nosy wannabe reporter,Veronica, starts stalking Rory, posting stories and pictures on her blog that make it clear (without actually printing her name) that Rory is the one and only suspect. And at Hester’s funeral, a close encounter with Chief Marshall reinforces this belief, making Rory more determined than ever to clear her name. After inventorying Hester’s art supplies the day after the funeral, Rory becomes distracted when someone breaks into her mother’s art store, and her mother is attacked. As she cleans up the mess, Rory discovers a damning piece of evidence that she believes is going to lead her straight to the killer. But after she confronts Trudy with what she has found, she is shocked when she finds Trudy dead the next morning. Even worse, Detective Green discovers Trudy’s cell phone and a near empty pill bottle in Rory’s back seat that makes her look very, very guilty. Undeterred, Rory and Liz keep digging into the history of all the players involved, until an innocent moment helps Rory realize who the real killer is. Can Rory and Liz trap the killer, before the killer can turn the tables and send Rory to the great beyond in a blaze of glory? Fatal Brushstroke is a good book, and on a scale of one to five, I would give it a four. I felt that Ms. Johnson was trying too hard at the beginning to make Rory look guilty as sin, and I got a bit tired of her withholding information from Detective Green. I understand Rory’s reluctance to trust the young detective because of Chief Marshall’s influence, but it bothered me that Rory kept saying she was innocent, but didn’t do much to prove it in the eyes of the law. As a writer, I do the same thing sometimes with my characters, but I felt this was a bit extreme. Once I figured out who the killer was, I did read it to the end to make sure I was correct (I was). Things did start to pick up from about the middle of the book to the end. Overall, it is a very good mystery, and I am invested in the characters enough that I am looking forward to the next Rory mystery. I wish I was talented enough in the art department to try some of the things Ms. Johnson describes in the book, because they sound like fun projects. Well done, Ms. Johnson! Fatal Brushstroke is available on Amazonand through IndieBound. As I sit writing the next installment in the Lizzie Crenshaw Mysteries, I couldn’t help but think about Mittens. 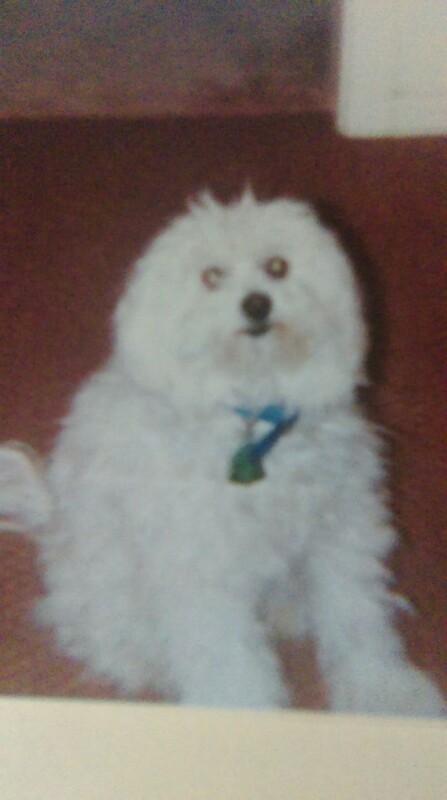 Many of you know Mittens as the dog Lizzie adopts following the murder of her caretaker, but many of you don’t know that Mittens is based on my own dog. That’s why I’ve decided to repost this blog from a few years ago. Those of you who have read Death Takes the Blue Ribbon, part of the Unlucky 7 collection, will see where the inspiration for the cheesecake scene originated! Don’t let the name “Mittens” fool you: when we named her, I was thinking she was white with black paws or black with white paws. Nope, she was a round, fluffy ball of white fur. We got her in the spring of 1977 while we were living in Artesia, New Mexico, and she was a wonderful addition to our family of four. Poor Dad – outnumbered by women! (You should have heard the yelling over the phone when I told him he was having a grandson! Oy! But that is a story for another day.) What kind of dog was she, you ask? After all these years, I don’t think we have ever decided what she was. She was a little bit of this, a little bit of that, wrapped in a medium size bundle of energy, sloppy kisses and lots of love. She spent her nights in the bathroom; so did Mother. Mittens whimpered and whined because she was all alone in there, so Mother would go in and hold her to calm her down. She fell asleep several times in the bathroom with Mittens in her arms, so naturally Mittens was Mother’s dog from the beginning. I wish I could find the picture Dad took of Mittens in the backyard: he put her inside this little red bucket and stepped across the yard to take a picture. All you see is this little white head peeking over the top of the bucket. Everyone always says that their dogs are unique, and I am no different. The most unique thing about Mittens was her tail. She didn’t wag it from side to side; it went round and round like a helicopter blade. I often wondered, when I watched that tail spin, what would happen if she took flight. Wouldn’t that have been a sight to see! One mistake Mother and Dad made was putting her doghouse on the other side of their bedroom window. They often said there was nothing like waking up to see a furry face staring at you in the window from the roof of her doghouse. But she didn’t always sleep outside. In fact, I think she only slept outside that first year. Most of my memories are of her sleeping on their bed every night. Sunday afternoons after church was (and still is) nap time. All you had to say was “nap”, and Mittens was on the bed before they were even in the bedroom. I should clarify something: she didn’t just sleep “on” the bed. Nine times out of ten, she was UNDER the covers, not on top of them. No, she wasn’t spoiled at ALL. That first winter, she disappeared one day from the backyard. Now, the fence looked like the in and out weaving of a straw basket, and she wasn’t full grown at that time. We looked everywhere for her until we got a call from our minister and good friend who lived down the alley from us. “Are you missing your dog?” he asked us. We said yes, and he told us that Mittens was at their house visiting their cocker spaniel, Angel. But we could not figure out how she got out. One day, Dad happened to look out back and saw her climbing the basket-weaved fence. He couldn’t believe what he was seeing, but it was true. She was a sneaky one. Since Dad is a minister, we moved a lot, but these moves never phased Mittens. She loved to ride in the car, usually in Dad’s lap, with one paw on the driver’s door. She always sat up front with them, rarely in the back with my sister and I. She preferred the view from the front. Did I mention she was sneaky? Once Dad finished seminary, we moved back to New Mexico, to a little town called Jal. Our house was located right next to the church. There was a chain link fence with a nice sized yard for Mittens to run around. But she had the tendency to dig under the fence and get out. Apparently she couldn’t climb chain link. One Sunday, Dad was leading the evening service when he got a funny look on his face. I looked up the aisle, and there was Mittens, crawling on her belly, covered in mud from the rain we had earlier. Guess who got elected to carry her home? Guess who was wearing white pants at the time? We moved forty miles up the road to Hobbs two years later. She was spoiled rotten by the people at Grandy’s restaurant. Whenever we went there, they always sent home chicken livers for her. She loved popcorn and grapes. But giving her jello was a funny sight to see. She would pick it up, flop it around inside her mouth, spit it out and look at us as if to say: “Are you kidding me? This stuff is gross!” The funniest memory I have of her involving food was the day of my high school graduation. Mother was making my favorite dessert, which has a pecan crust. She put it on the floor by the back door, hoping it would cool faster. A few minutes later, we heard “clink clink clink”, and discovered that Mittens had eaten half of the crust, had two paws in the dish and was polishing off the other half. We still laugh about that one. We had a long foyer at the house in Hobbs that was linoleum. Mittens loved to chase tennis balls, and Dad would throw them toward that foyer almost every time. You could hear her toenails clicking on the floor, usually followed by a thud, which meant she had chased the ball to the door and slid right into it. It never phased her. She came running back with that ball, gave it to him, ready to go again. But she also loved to spend time sitting on the couch or in the recliner with us. She was a great snuggler. I graduated from high school in 1986, and went my own way, so I didn’t get to see her as often as I would have liked. The rest of the family moved to El Paso in 1988, but by this time, Mittens was beginning to show her age. She was content to sit on her favorite blanket in a chair. I got married in the fall of 1990. Two months later, while my parents were on vacation in Colorado, and with my sister home with her, Mittens’ health took a turn for the worse. My sister took her to the vet, where they put Mittens to sleep. We buried her ashes in my grandmother’s home in Artesia, fifteen years after she first came into our hearts and our lives. We look back on those years with her with plenty of laughter. She will always be Mittens the Wonder Dog with the helicopter tail, climbing fences, chasing tennis balls and giving us all the love we could ever want. It’s Promote an Author Tuesday. 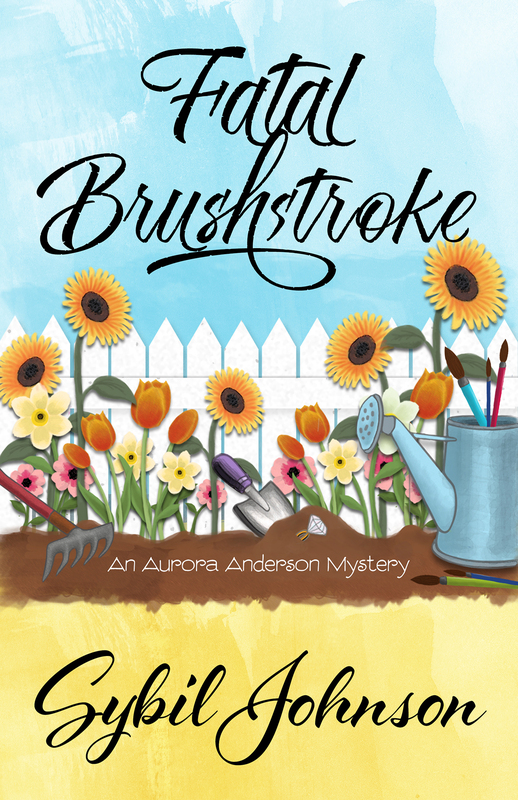 Meet Fatal Brushstroke author Sybil Johnson! For a full review of this mystery, stop back on Thursday! Sybil Johnson grew up in the Pacific Northwest. Frequent trips to the library introduced her to the Land of Oz, Mrs. Piggle-Wiggle, Bilbo Baggins and a whole lot more. She fell in love with mysteries reading Encyclopedia Brown and Nancy Drew. In junior high, she discovered Agatha Christie. After high school graduation, Sybil moved south to attend the University of Southern California, majoring in Computer Science. After twenty years of designing and writing code and managing programmers and software development projects, she turned to a life of crime writing. Her short fiction has appeared in Mysterical-E, Spinetingler Magazine, King’s River Life Magazine, Crimson Dagger, and Silver Moon Magazine. 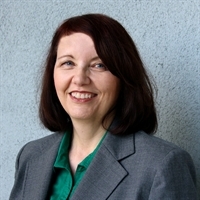 A past president of Sisters in Crime/Los Angeles, Sybil also co-chaired the 2011 California Crime Writers Conference. In her spare time, she enjoys tole painting, studying ancient languages (Ancient Egyptian and Coptic are her current areas of interest), and spending time with friends and family. Dissolution by C. J. Sansom. A great historical mystery. Aunt Dimity’s Death by Nancy Atherton. Love that book. I’ve read it several times. I don’t remember this one, but I’ve heard it a number of times. We were visiting relatives. I was young, maybe 3 or 4. My aunt made donuts. My parents, sister and I went to visit other relatives. When we got back to my aunt’s house, she’d put the donuts in a glass jar. Apparently, I was very disappointed and said, “She canned the donuts!” That’s the only story I can remember that’s been told several times. Where would Rory go on vacation? She’d go on a Caribbean cruise with her best friend Liz. They’d explore the ports together during the day, then Liz could dance the night away while Rory sits on the deck and looks at the stars. Fatal Brushstroke is available on Amazon and through IndieBound.